This is one of my favourite ‘behind the scenes‘ photos to ever surface from PSYCHO (1960). This picture of Anthony Perkins and two mysterious ladies (it certainly isn’t Vera Miles and Janet Leigh) was, according to Vintage Los Angeles, taken on November 20th 1959. 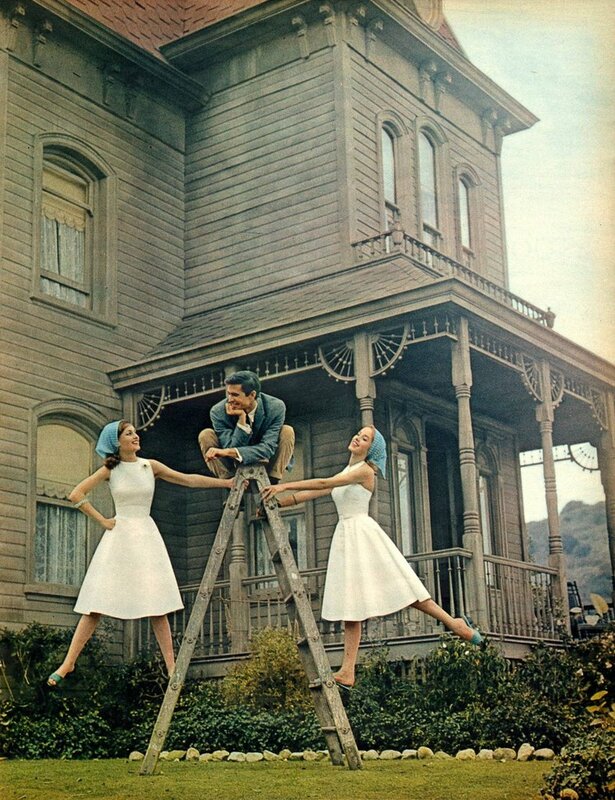 The Bates house was constructed on the backlot at Universal City Studios in the same year. Perkins is doing his very best Jack Skellington impersonation, all limber and gangley, perched atop the ladder much like one of Hitchcock’s famous birds. The smile on Perkins’ face, a feature so unused from this moment onward in his career, is particularly wonderful. Needless to say, Mother would not be pleased by this scene at all. 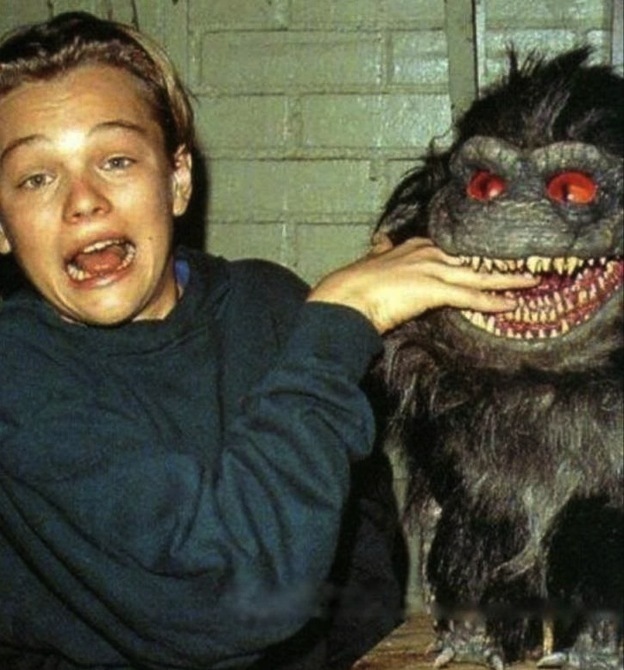 Check out this rare glimpse into the off-set lives of The Goonies. This photo, taken from the Astoria classroom trailer, shows every single Goonie (minus Sloth if you want to get technical) taking lessons in god-knows-what on some some kind of vintage PC. The random non-Gonnie is likely their tutor.., It’s definitely not Ma Fratelli. Interestingly Mikey, Brand, and Mouth are all in costume, so this was probably taken early-on in filming. Chunk is naturally wearing bull horns. 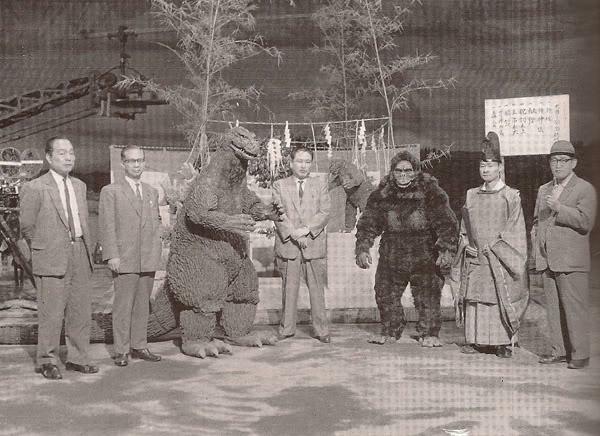 When the two behemoths of monster cinema take time off from destroying pagoda’s they enjoy nothing more than an ice tea whilst fulfilling media duties such as this gem of a backstage photo taken during the filming of King Kong vs Godzilla. I believe the chap standing in the middle like a well groomed UFG referee is none other than Godzilla creator Tomoyuki Tanaka. Sheer wonderment from a no-CG era.